Family fun happens just about everywhere; luckily, that's exactly where COOLPIX S32 can go! It can dive underwater down to 10m deep, handle drops from up to 1.4m high, and you can even take it in the snow when temperatures are as cold as -10°C—places many wouldn't want to bring a smartphone. 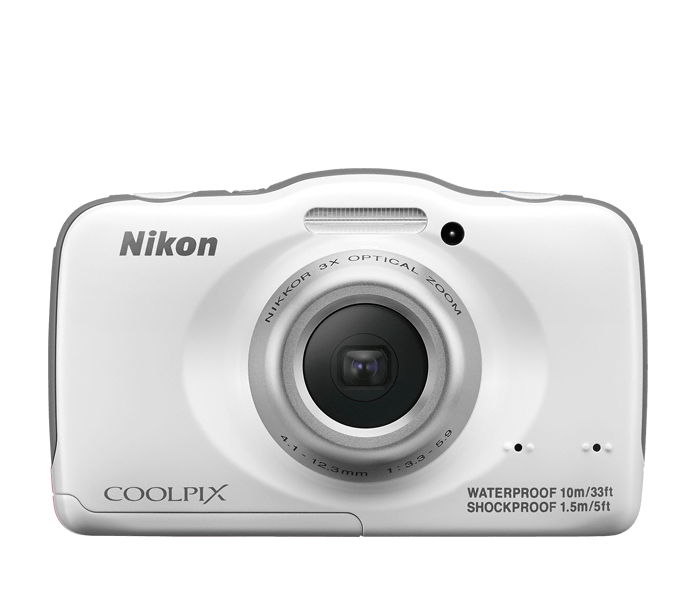 The COOLPIX S32 will keep capturing outstanding high-resolution photos and Full HD 1080p videos with stereo sound. Oversized buttons and intuitive menus make operation a breeze, and the camera's low-light image sensor helps capture sharp photos underwater, indoors at parties, outside when the sun is setting—all without a flash! The COOLPIX S32 can go diving up to 10m deep, withstand drops of up to 1.4m and can play in the snow at temperatures as cold as -10°C, so even the roughest conditions won't stop you from recording precious memories. Safe to take to the beach, pool, playground and any place fit for family fun—you can always get a great shot of the action. Easily match your situation to one of 14 Scene Modes like underwater, night, close-ups and more.